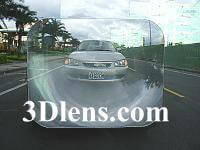 Wide angle rear window lens for car backing. Benefit: Stick the lens on rear window to enable driver to actually see many objects under the rear window you can't not see through inside mirror and outside rear view mirrors. Use the fresnel rear window wide angle lens, you can avoid accidents due to the children, pets and other low-lying objects in blind spot behind your vehicle while backing up. Apply magnifier to the window of your house. It is easy to keep your eye on kids, yard, pool or pets. Also can help to warn you against unwanted visitors. Application: Back window of auto, RV, vans, coach, bus, camper, wagon, SUV, side window of truck.